An extra-safe, if inconvenient, nesting place. Carolina Wren nest by Stan DeForest. Every year, the public has questions about nesting birds, particularly those that are conspicuous or somehow compromised. Below, we recap some of these common questions and clarify which seemingly helpful interactions run afoul of the law. I found an abandoned baby bird and took it home to raise it. It’s illegal, unless that baby bird is a House Sparrow, European Starling, or Rock Pigeon (can you really tell them apart as nestlings?). If the bird is unable to sit up or get around, and you can’t locate the original nest to put it back, it’s better to take it to a wildlife rehabilitator. If it can hop or walk, leave it alone; it’s parents are probably nearby. A bird laid its eggs in an inconvenient place. Can I move the nest? It’s illegal to move a nest just because it’s inconvenient to you. If the nest is truly in a life-threatening place (e.g., in your car’s exhaust pipe), or it is damaged as a result of being somewhere inappropriate, please call the U.S. Fish and Wildlife Service for advice. A bird is starting to build a nest in an inconvenient place. Can I discourage it? 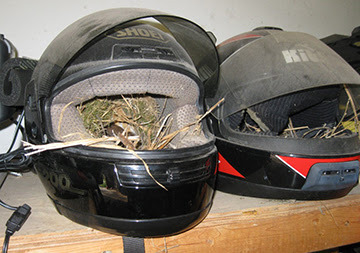 Yes, you can discourage a bird that has just started building a nest, before it lays any eggs. The distinction from the previous question is that an inactive nest (no eggs or young) can be removed, but an active one cannot. A nest in one of my boxes got wet, so I replaced it with a dry nest. This is technically illegal. A better solution would be to repair the nest box at your earliest opportunity so that it doesn’t leak. Use duct tape for a quick fix along a leaky seam. I want to measure/weigh/mark birds in a nest. This is only legal if you have been granted a permit for scientific research. This information is meant to help you understand the law and NestWatch protocol. It should not be construed as legal advice. Some activities may require a permit, which can be obtained by contacting your regional U.S. Fish and Wildlife Service office.